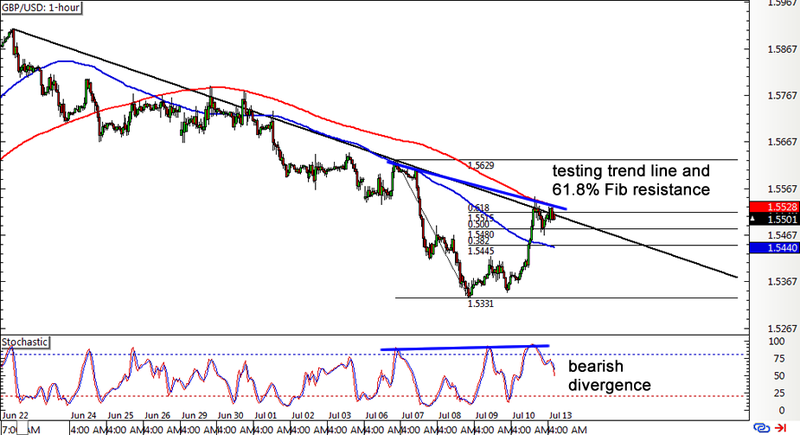 First up, here’s a quick update on the GBP/USD pullback play I showed y’all last week. The pair did move all the way up to test the descending trend line around the 61.8% Fibonacci retracement level and 200 SMA, which might keep further forex gains in check. In addition, a bearish divergence can be seen, as price made lower highs while stochastic made higher highs. Stochastic is already heading south, which suggests that pound bears are gaining enough energy to push GBP/USD down to its previous lows around 1.5330. However, the recent consolidation looks somewhat like a bullish flag so I wouldn’t rule out the possibility of an upside breakout and reversal just yet. 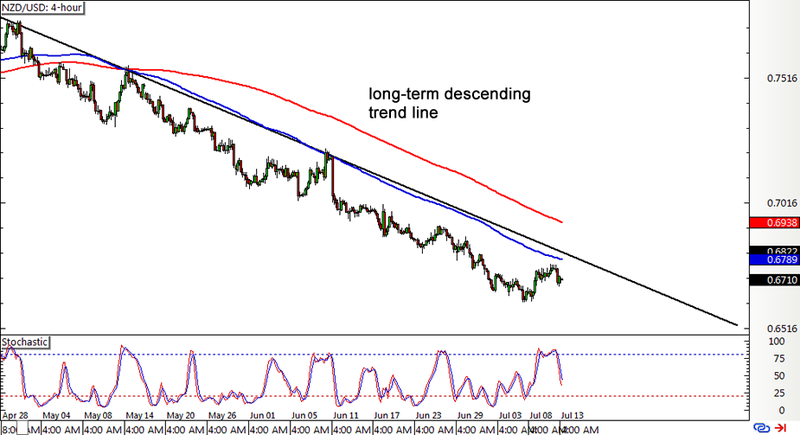 If you’re hoping to catch the Kiwi’s southbound train, then this descending trend line setup on NZD/USD’s 4-hour forex time frame might be your chance. The pair seems to be in the middle of a correction from its previous slide and may pull up to the longer-term trend line and 100 SMA around the .6800 major psychological resistance. If more Kiwi bears hop in this area, the pair could resume its route to the previous lows around .6625 or even head further south. Stochastic is pointing down while the 100 SMA is below the 200 SMA, indicating that sellers are still in control of the game. If you’re looking for more confirmation, better wait for reversal candlesticks around the trend line before shorting. Not in a rush to jump in any trades just yet? 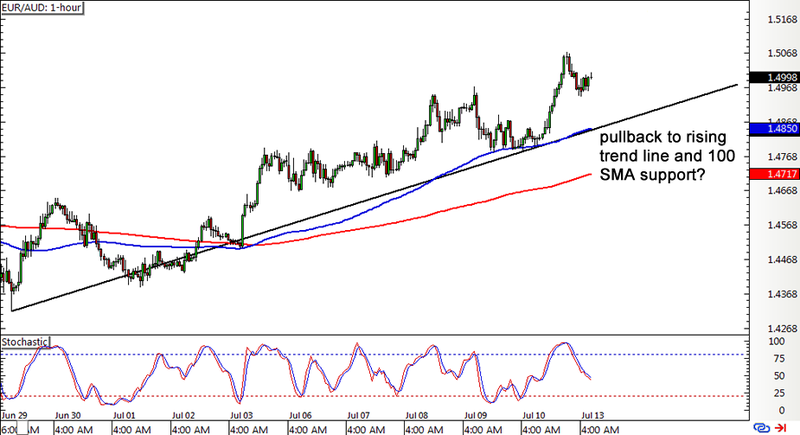 Then you might wanna keep close tabs on this ascending trend line setup on EUR/AUD’s 1-hour forex chart. The pair’s rally seems to be running out of steam, which suggests that a pullback to the rising support area might be in order. This lines up with the 100 SMA and the 1.4850 minor psychological level, where some euro bulls could be waiting to jump in the uptrend. Stochastic is still heading lower anyway, so there could be enough bearish momentum to lead to a test of the trend line. However, if bears keep gaining strength, they could push for a downside break of the trend line and further losses for EUR/AUD. Gotta set those stops below the trend line if you’re gonna go long!